Samuel Duffett was born in Yeovil in 1798, the son of George Duffett. Samuel's baptism was recorded in the Independent Church Register of Baptisms on 4 March 1798; his older brother George was baptised in 1795, and older brother Samuel was baptised in 1796 but clearly died in infancy, and two younger brothers were baptised, James in 1799 and John in 1800. Samuel was a Freemason, initiated into the Lodge of Brotherly Love in Yeovil in 1820. On 11 September 1821, at St John's church, Samuel married Elizabeth Collins, the youngest daughter of glove manufacturer Henry Collins of Court Ash House. Samuel was listed as early as 1824 as a glove manufacturer of Silver Street in Pigot's Directory at which time he would only have been aged about 26. He was listed on the Jury List of 1827 and was mentioned as a glove manufacturer in a deed dated 1829. Pigot's Directory of 1830 again listed him as a glove manufacturer of Silver Street. The 1832 and 1834 poll books listed Samuel as living in Silver Street by virtue of owning a freehold house there, while his older brother George (a grocer and tea dealer) was resident in newly-built Wine Street and was in the poll books by virtue of owning freehold land at Preston Road. It is likely that an older brother, David, was licensee of the Full Moon Inn in Wine Street. Samuel was listed as a glove manufacturer of Silver Street in the Somerset Gazette Directory of 1840 but his final listing in the trade directories was as a glove manufacturer of Vicarage Street, and this was in the 1842 edition of Pigot's Directory. The 1841 census listed 40-year-old Samuel as a glove manufacturer living next door but one to the Pall Tavern in Silver Street. Living with him was his wife Elizabeth, five years his senior, and their five daughters; Anna aged 15, Emily aged 13, Louisa aged 11, Matilda aged nine and Flora aged six. There were also two female servants. Samuel and Elizabeth had at least one son, Henry, who was articled by his father to a solicitor in 1842. Henry became an attorney in 1847. Samuel and Elizabeth had significant land holdings in Yeovil, tabulated below. Their own holdings amounted to over four acres and the nursery either side of Hendford Hill and leased to Edward Pierce was another two acres. Lockyer's Mead was a six acre meadow just to the north of the Union House in Preston Road and In Hop Yard was a four acre pasture. Their total land holdings were 16a 3r 26p. In its edition of 17 August 1844, the Sherborne Mercury reported "Died - 12 August, at Weymouth, Mr Samuel Duffett of Yeovil, glove manufacturer, leaving a widow and a large family, to deplore his loss." By the time of the 1851 census Elizabeth, still living at Silver Street with her children, was listed as a widow. She later moved to Princes Street, at the junction with North Lane, but died in the summer of 1868. In the 1846 Tithe Apportionment, following Samuel's death, Elizabeth was listed as the owner of the following parcels of land. She still retained her home and her husband's glove factory. 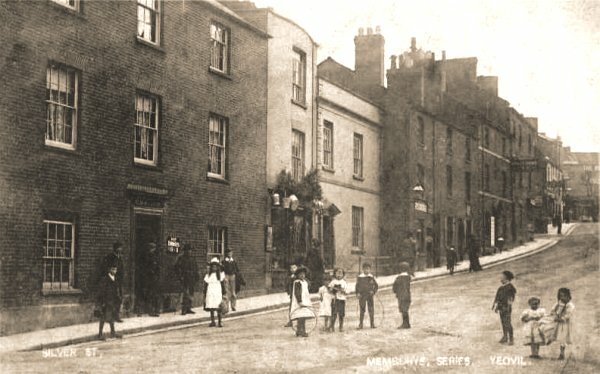 This postcard dates to around 1900 and shows the Pall Tavern at extreme left. Samuel Duffett's house was the two-storey house at centre. 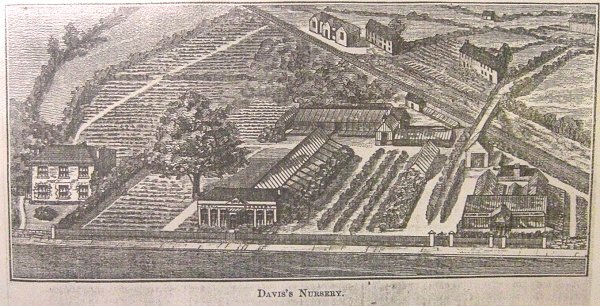 A sketch of the house and nursery on Hendford Hill owned by Samuel Duffett and leased to Edward Pierce. By the time of this sketch it was owned by Benjamin Davis (who succeeded Edward Pierce in 1875). Hendford Hill is running across the bottom of the sketch and the railway lines runs diagonally across the top right.